BlogHome » News » Learn how to do LinkedIn lead generation today! Do you need a steady supply of good quality, high converting leads for your business? Do you spend too much time chasing what appears to be an ever decreasing pot of clients? Is the competition in your market increasing? If you’ve never thought about using LinkedIn to generate great quality leads that convert then you’ve been missing out on the biggest opportunity for business to business there is online. LinkedIn has over 277 million members worldwide. In the UK, there are over 15 million members, that’s over a quarter of the entire population of the country. It’s the one social network dedicated to business and it’s 3 times more effective than either Twitter or Facebook for visitor-to-lead conversions. 65% of B2B companies have generated leads through LinkedIn. And if you have a business blog LinkedIn delivers 50% more traffic than any other social network. But don’t just take my word for it. Business’s just like yours are generating leads and significant sales just by using LinkedIn. Postcard Mania, a US start up generated 600 leads and $72,000 dollars in revenue just by using LinkedIn groups effectively and London based Reconverse saythat 90% of their business comes as a result of their activity on LinkedIn. It even works for consumer focused businesses. The Hysterectomy Association doubled its ad revenue in just 2 months by focusing on niche members of the LinkedIn community. And I picked up just one client who’s been responsible for generating £15,000 of business through the jobs section. As the author of Amazon’ UK’s best selling book, LinkedIn Made Easy: Business social networking simplified, I’ve been in the privileged position of working with many small and medium sized businesses over the years. And their constant comment is that they never realised just how powerful LinkedIn could be. The knowledge about how these two things apply on LinkedIn. 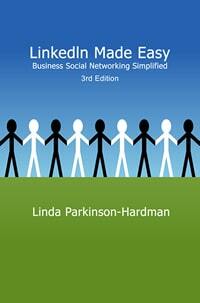 If you want to your business to step up a gear and start generating quality leads through LinkedIn then it’s time for you to grab your copy of LinkedIn Made Easy: Business social networking simplified. It will help you understand the 3 steps you need to follow and provide you with a set of really useful recipes to tailor to your unique business needs.